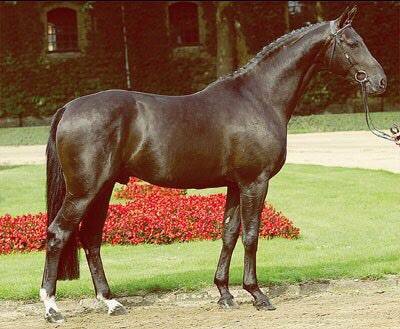 Rubinus is a tall elegant black stallion sired by Rubinstein and out of the Elite mare, Rocca (Rouletto/Montevideo). Rubinus was inspected and approved for breeding by both the AHS and the Hanoverian Verband in 2011, scoring extremely well receiving an overall 8. In 2003, Rubinus successfully completed both his 30-Day and 70-Day Tests in Warendorf with good results. At his 70-Day Test, Rubinus finished sixth overall out of 24 stallions. Rubinus stood his first few seasons at the Westfalen State Stud in Warendorf, where he was successful in young dressage horse classes. In 2010 Rubinus was successful in the dressage arena, with a Championship at Third Level under FEI judges. He has three very good powerful gaits, demonstrates high rideability and a good temperament. He is a very easy stallion who loves to work. In 2011 Rubinus debuted in the hunter ring, and proved his versatility with many top placings. Rubinus has also been successful as a sire, with several foals from his first foal crops qualifying for the German Foal Championships in Lienen. In 2006, he sired the second Reserve Champion foal at the Foal Championships. His oldest offspring have started competing successfully in sport in Germany. Rubinus’ first North American foal crop was born in 2010 and it has resulted in numerous Premium foals with several registries. Rubinus’ foals are clearly stamped by their father with friendly easy going temperaments, modern type, pretty heads, correct conformation, and superior gaits. Rubinus has been trained to the Prix St. George’s level and with plans to return to the dressage ring in 2015.